Admin can view feeds for multi-channel bookings that will be fetched from Myallocator at every specified interval. 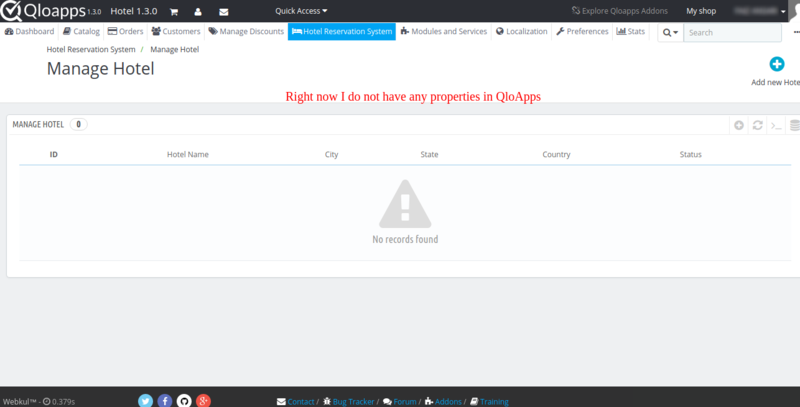 Now admin has the option to create QloApps properties on myallocator. Firstly, the Admin needs a Myallocator account to use Myallocator channel manager. If you have already had an account then login otherwise please create an account. 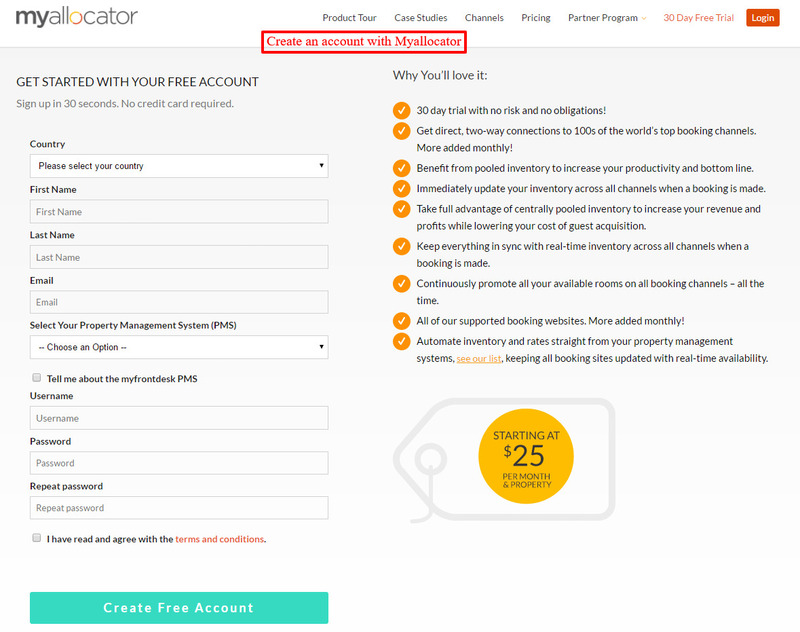 To create go to Myallocator website and click the ‘Login‘ button in the top right corner. Then on the login page click ‘Create Account‘ link to create a new account. Then Admin can register by filling the form as shown here. After creating the account Admin must log in the Myallocator account with the registered username and password. Admin has to click on the username and select ‘Add new property‘ option. Admin has to fill the information about the property in the given form. After filling the form Admin must click ‘Create Linked Property‘ to complete the process. Once the property is created the Admin must add Room Types to it. 2. Then select ‘Room Types‘ from the menu. 3. On the Room Types page, click the ‘New Room Type‘ button to add new room types to the hotel. 4. Fill the information about the new room type and finally click the ‘ADD‘ button to add it to the hotel. 4. Click on the ‘Install’ button to start the installation. 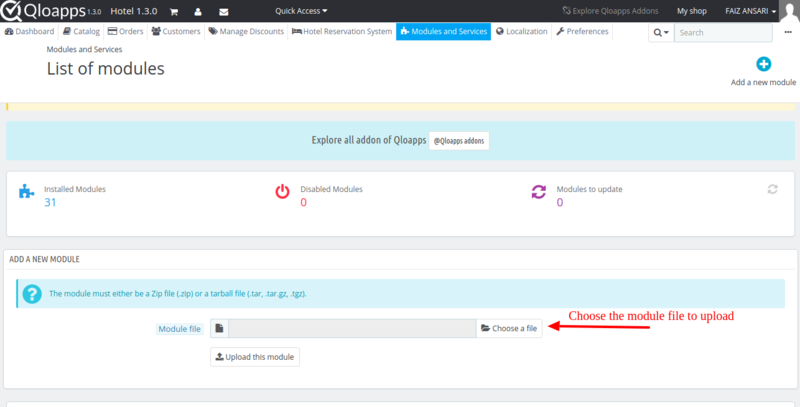 This is how Admin can install the module successfully. 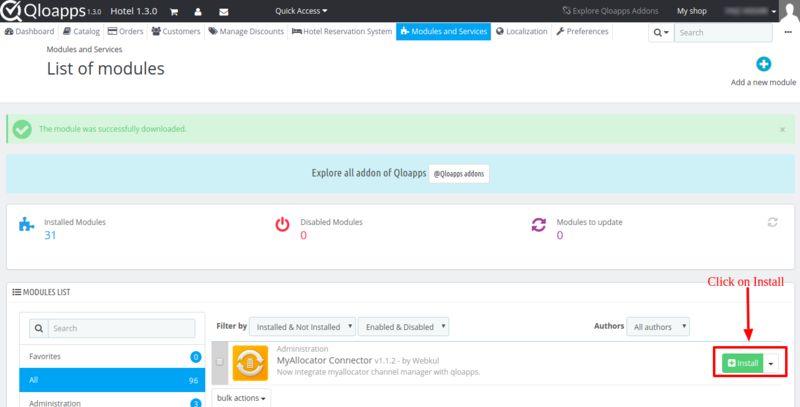 Once the installation is complete the Admin can configure the module. 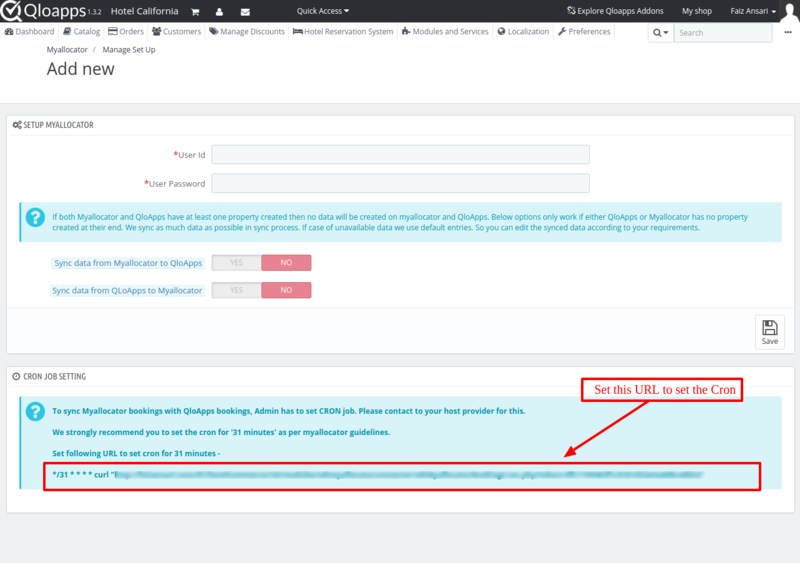 Here Admin has to enter the registered Myallocator username and password and click ‘Save‘ to establish a connection between Qloapps and Myallocator. When you select yes in Sync data from Myallocator to QloApps then the properties created in Myallocator will be imported to QloApps. Note: This feature will only work when you have no property in QloApps Marketplace while importing properties from Myallocator and vice versa. But I have created a property in Myallocator. When I configured the Module with “Sync data from Myallocator” option ON then my Myallocator properties will be created in QloApps automatically. 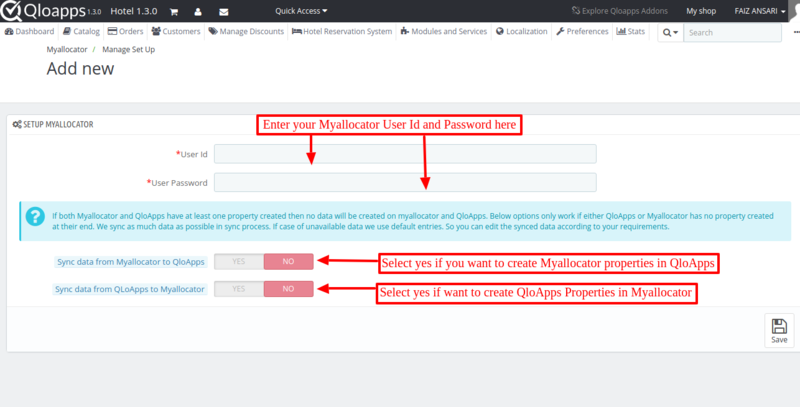 In the same manner, the QloApps property will be created in MyAllocator. Note: These options will only work if there is no property already created in QloApps or Myallocator. If you want to create Myallocator properties in QloApps then there should no property in QloApps and vice-versa. To sync your bookings with Myallocator you will have to ask your hosting provider to set up the cron job on your server. As per Myallocator Channel Manager guideline, we strongly suggest that you set the cron for 31 minutes. By doing this your booking data will be fetched from myallocator at every 31 minutes. The admin has to set a cron task by entering the link generated by the system. So that if there are any bookings in the Myallocator, then those changes will get updated on a server when a cron runs. 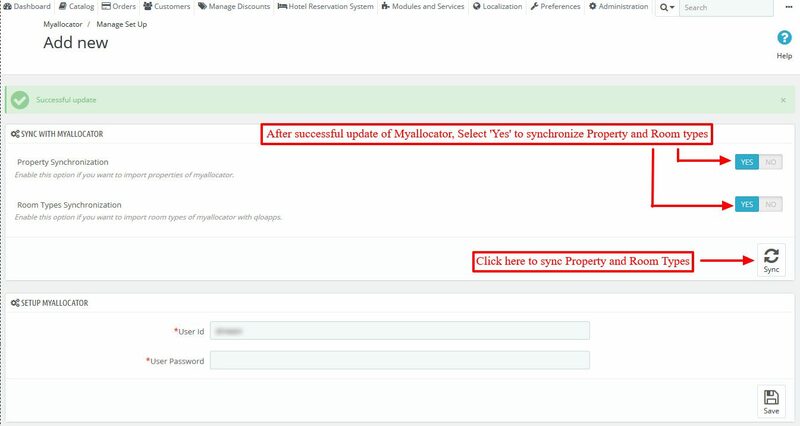 If Admin has created new properties and/or room types in Myallocator, then he/she can choose to sync with Qloapps through the ‘Sync with Myallocator‘ section. To do so Admin has to choose ‘Yes‘ for Property and Room Type Synchronization. 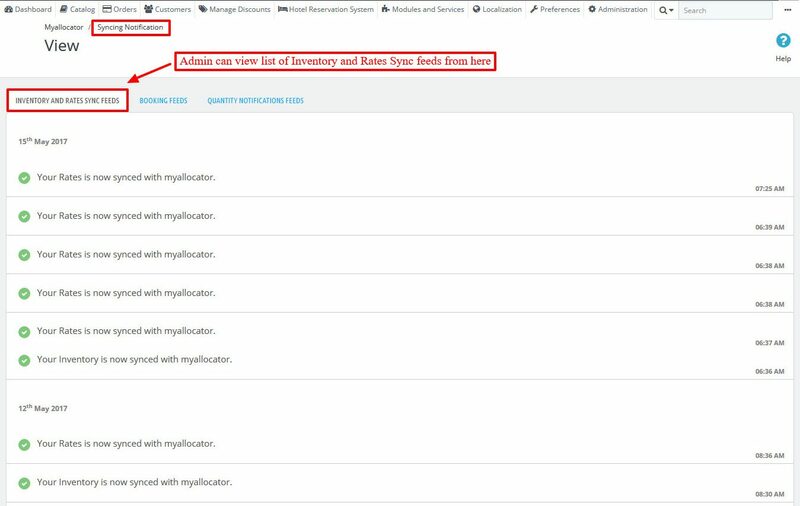 Admin must map the properties and room types after the setting up the Myallocator credentials. First, the Admin must Map properties and later map the room types of particular properties. 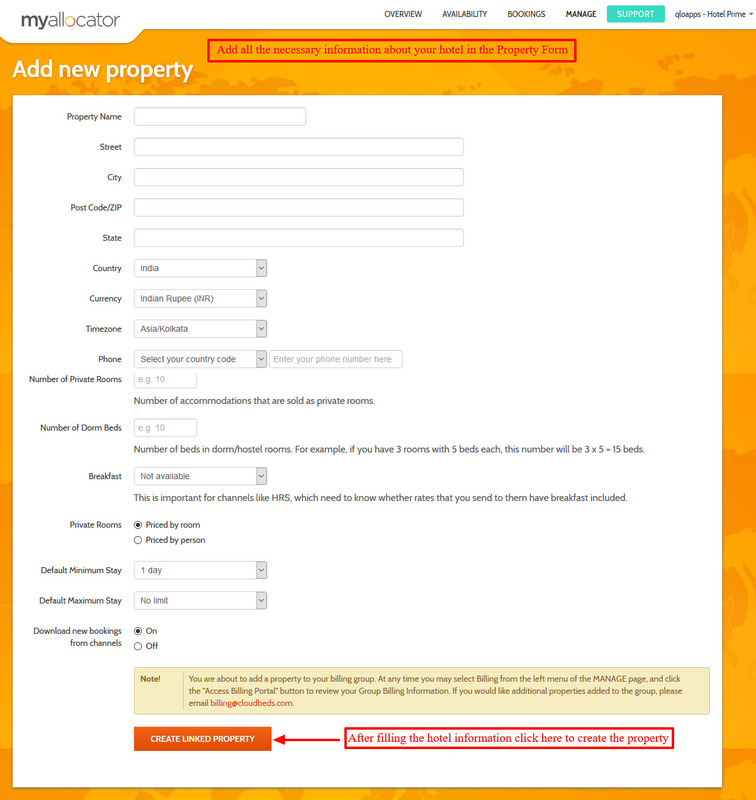 On this page, Admin can select a property added in Qloapps and Myallocator and click ‘Map Property‘ button. After that, the mapped property will be visible in the ‘Manage Mapping‘ page. 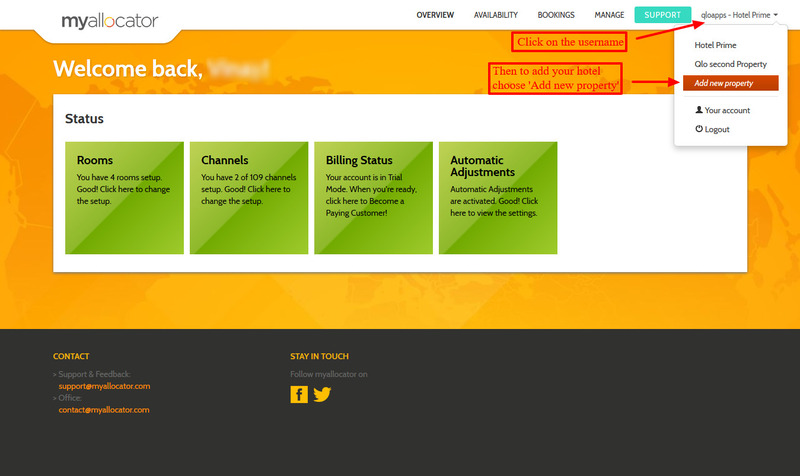 Go to the list of mapped hotel and click on ‘RoomType Mapping‘ button. Admin must select room types to be mapped and click the ‘Map RoomType‘ button. The list of mapped room types is visible on the Manage Mapping page under the Mapped Room Type section. With the help of Myallocator Module installed on Qloapps, the Admin can easily sync the Prices/Rates and Availability/Inventory of room types. Go to ‘Myallocator‘ in the main menu and Select ‘Price and Availability Manager‘ to visit its page. View both the prices and availability for the selected time period. Can select different mapped hotel properties. Synchronize the Prices and Availability of Room Types. Go to Availability tab from the menu. This page shows the synced Prices and Availability of the mapped Room Types. Let us suppose there is a hotel called The Hotel Prime which has 5 Delux rooms available. A customer books one Deluxe Room for a duration of 15th to 27th of May, then only four deluxe rooms are available for bookings as shown in the screenshot below. 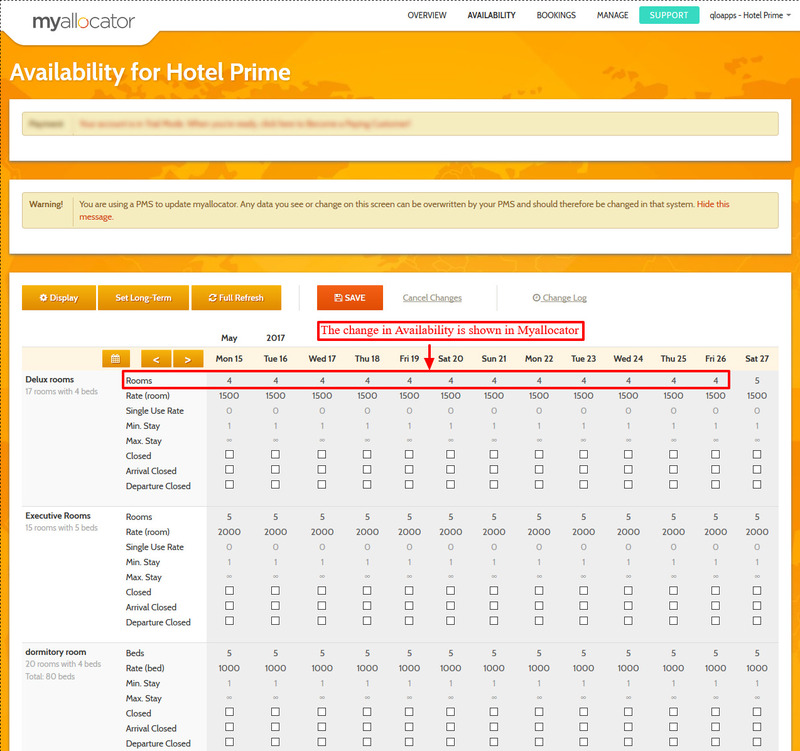 The Admin must click ‘Save Change‘ button to sync the availability of rooms in Qloapps to that of Myallocator. Admin can view the changes made in Myallocator account after the syncing process is completed. Suppose, the Admin changes the rates of a room type, for example, he changes the rate of Executive rooms from $2000 to $1800. In such case, Admin can go to the Price and Availability Manager page and click the ‘Save Changes‘ button to sync the changed price/rate with Myallocator as shown in the screenshot here. The change in the price/rates will be visible to the Admin in the Myallocator channel manager. 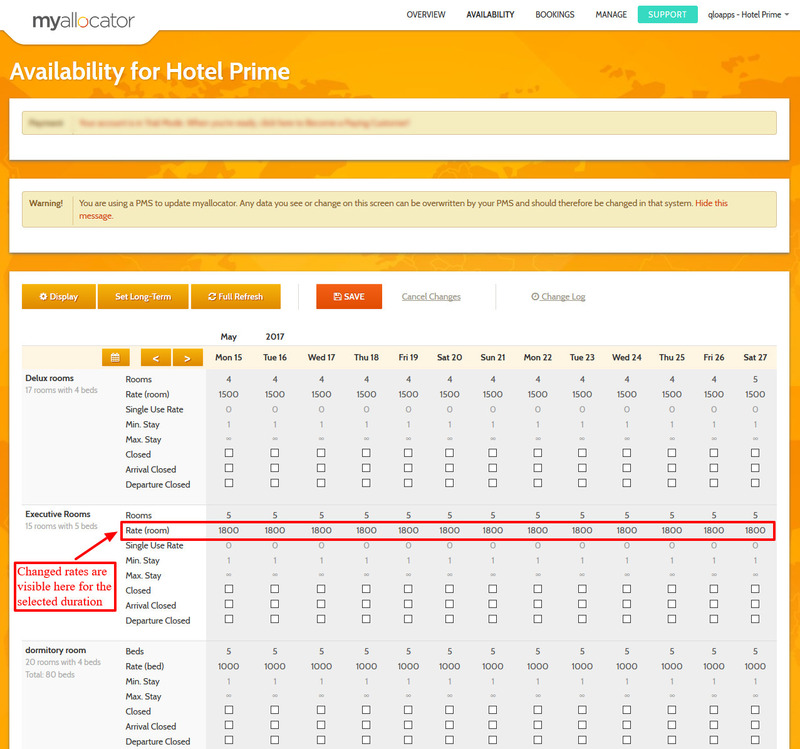 This is how Admin can sync and manage the Prices and Availability of Room Types through the Myallocator Integration Module. Notifications are helpful as it informs Admin about the current status of availability of room types. 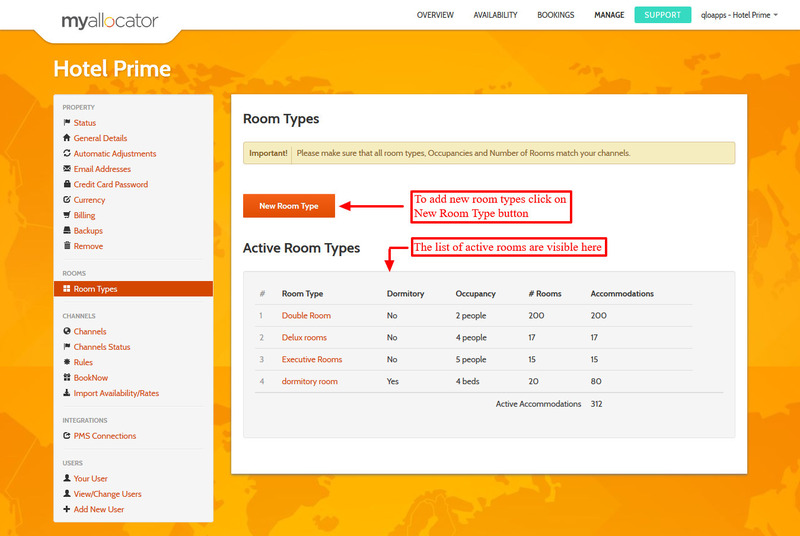 Admin can get notifications about the room inventory on the dashboard whenever there is less number of rooms than the specified limit. 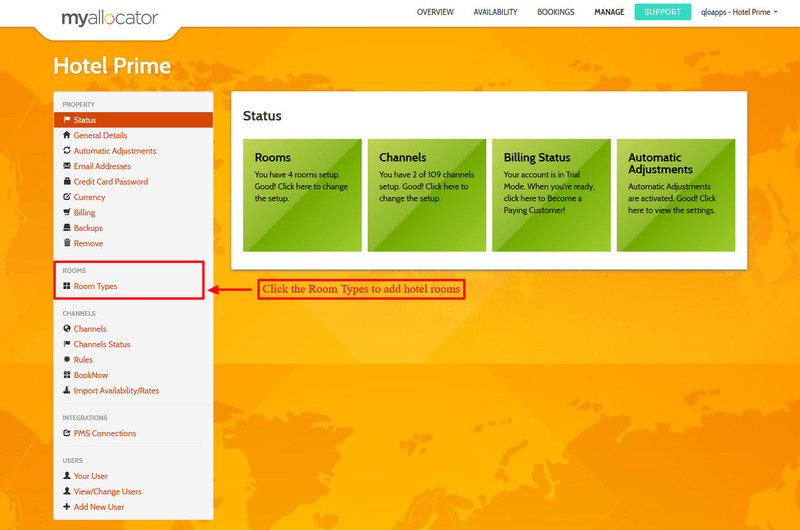 On this page, the Admin can specify a limit by entering a number for each room type. If the availability or inventory of any room type is less than the limit, notifications for those rooms will be displayed on the dashboard. Let us assume that Admin enters a limit for each room type as 10. Now, this is how the notifications will be visible to the Admin in the back-end. 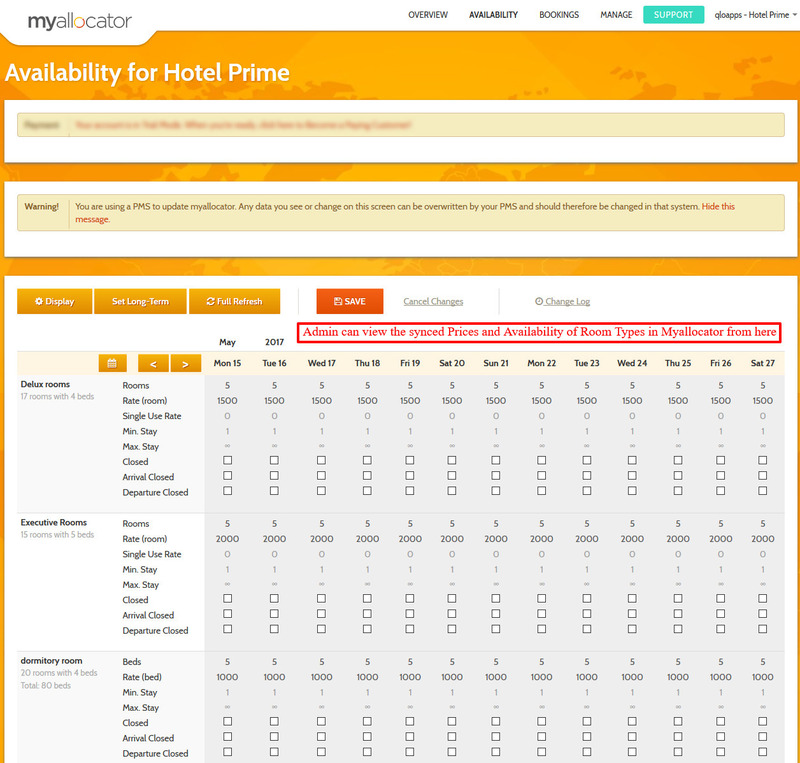 The Booking Manager page displays all the bookings made through the Myallocator channel manager. Admin can view information like Myallocator Booking Id, Order Total, Currency, Order Source and Order Date. 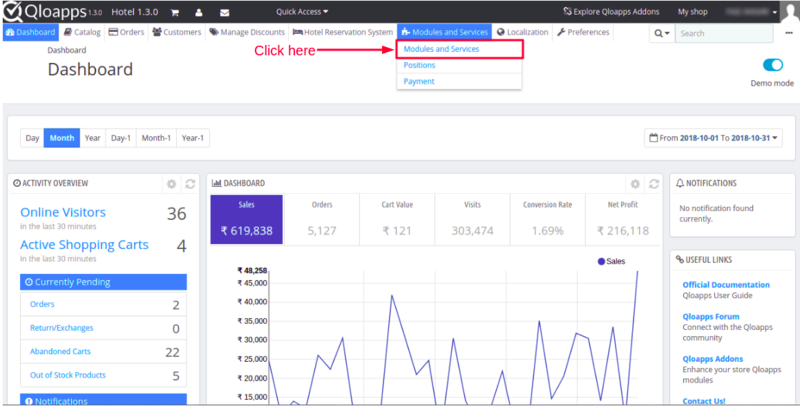 This page allows Admin to view all the notifications related to room type quantity, inventory and rates syncing and reservations made through multiple online booking channels/Online travel agencies(OTA). With a pie chart on the dashboard, Admin can keep easily track of bookings made via customers across different online travel websites. 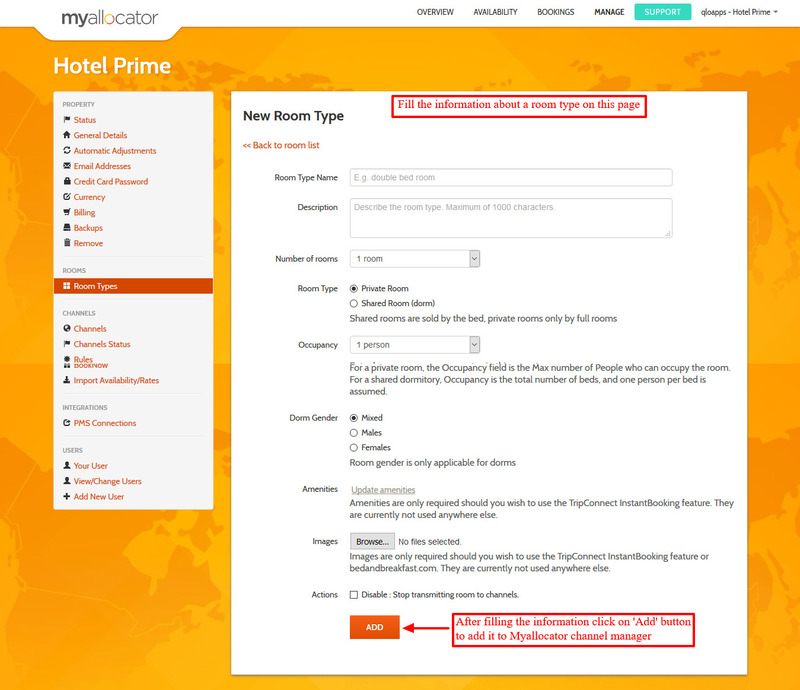 This is how Admin can map and synchronize bookings of hotel properties and room types from Myallocator channel manager. 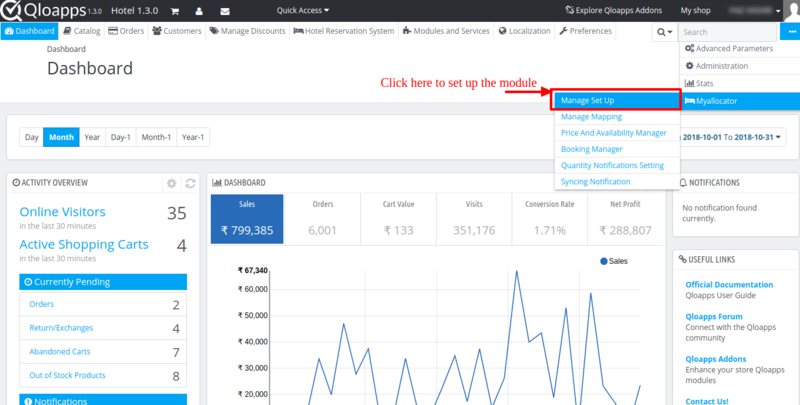 When you will fetch the booking first time in this module, it will fetch the bookings of the last 30 minutes and then it will keep fetching bookings at every specified interval through Cron.